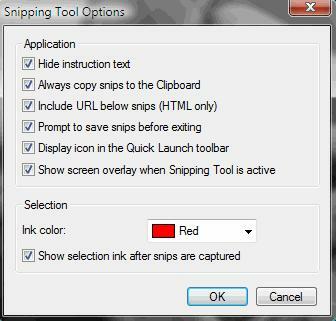 When using Snipping Tool in Windows to capture a screen shot, the snipped image or picture of the selected area or window may appear on Snipping Tool with a red border (the color may be different depending on which ink color is selected). You cannot use Eraser to delete or remove the border around the snip. The symptom is not a problem or error, but instead is a feature in Snipping Tool which can be easily disabled. To turn off the red or blue or whatever color selection border around the captured image after snipping, click on Options button, or click on menu item Tools -> Options. In the Options dialog window, under the Selection section, unselect and untick the Show selection ink after snips are captured option, and then press OK button. From now onward, all pictures, images or photos captured will be free of border around them. To enable or put back the border onto snip, simply check the setting again. You can also select another ink color for the border if you want the border to appear around the images. Ink colors available for selection include black, maroon, green, olive, navy, purple, teal, grey, silver, red, lime, yellow, blue, fuchsia, aqua and white.